This story was updated at 10:08 a.m. ET. HOUSTON — Astronauts working outside the International Space Station early Sunday (May 22) ran into problems with bolts and washers popping free, forcing Mission Control to ultimately extend the spacewalk, but the two spaceflyers still managed to finish work to lubricate a joint in the station's vital power system and refill its ammonia coolant supply. Shuttle Endeavour astronauts Andrew Feustel and Mike Fincke ventured outside the space station at 2:05 a.m. EDT (0605 GMT) tasked with topping off the complex's slowly-leaking cooling loop and greasing the left-side solar arrays' rotary joint. Originally scheduled as a 6 1/2-hour excursion, the spacewalk ultimately required 8 hours and 7 minutes, ending at 10:12 a.m. EDT (1412 GMT). The spacewalk was the sixth longest in history. "Great job guys, you got it all done. Outstanding work!" said Greg Chamitoff, the spacewalk's choreographer, to Fincke and Feustel. "You guys earned your pay for the day." "Do we get paid?" replied Feustel. "I think our pay was just being out here looking at the Earth spinning by. It's beautiful." This still from a video taken by the spacesuit helmet camera of astronaut Mike Fincke shows one of four loose bolts he caught as they floated free of the International Space Station during a May 22, 2011 spacewalk to grease up a solar array gear. "Mike, the status of bolt 1, you have it?" asked Chamitoff to Fincke, who was working to free thermal covers covering the joint's mechanism. "No, it went to heaven," replied Fincke. Feustel, working nearby on the ammonia coolant system, spotted the bolt as it slowly floated toward the left side of the station. Astronauts working inside the space station were able to photograph the bolt and send the images to Mission Control. At least four other bolts came free from the thermal covers, but Fincke was able to catch them before they floated away. "[Fincke] was doing a great job at being gentle. And again he gets the golden glove award for another catch. That was fantastic," Mission Control radioed the astronauts. "We really don't have a good answer for why that is happening." The retaining washers, designed to hold the bolts in place, were either missing or bent, reported Fincke. One of the washers that was still present came free and was also lost. As a result, Mission Control decided to have the spacewalkers open only four of the six covers originally planned and take extra caution while doing so. "We're going to minimize the number of covers we're going to take off," said spacecraft communicator Steven Swanson from on Mission Control in Houston, Texas. "We'd like though, as [Fincke] takes them off, to go to seven turns [with a power tool] and then if possible, use his hands to gently turn the next two turns until [the bolt] pops up." "I'd like to be even more methodical than usual on these. We'll get the job done and be even more careful," Fincke said. This view from a spacewalker helmet camera shows the International Space Station's port side Solar Alpha Rotary Joint (gear in center), a huge gear that turns the station's port solar arrays, during a May 22, 2011 spacewalk by astronauts Andrew Feustel and Mike Fincke. The waterwheel-like joint, known as a Solar Alpha Rotary Joint, is one of two large gears used to turn the space station's outboard solar arrays so that they always face the sun. In 2007, the joint's right-side counterpart was found to be grinding against itself, depositing metal fragments into the mechanism, slowing its rotation. A 2008 shuttle Endeavour mission had spacewalkers apply grease to joints, resolving the problem. The Solar Alpha Rotary Joints now need to be periodically greased, which is what Fincke and Feustel worked to do today. With the coolant system refilled and the rotary joint partially lubed, the spacewalkers turned their attention to installing two stowage beams for a radiator and adding a camera cover and lubricating the hand of the Canadian-built two-armed robot, Dextre. While they did that work, Mission Control remotely commanded the station's left-side Solar Alpha Rotary Joint to rotate so the grease applied by the astronauts was spread evenly around the ring. 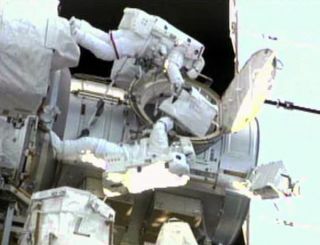 At the end of the spacewalk, Fincke and Feustel returned to the rotary joint to apply even more lubrication and then reinstalled all but one the covers they removed earlier. They brought the remaining cover back inside the space station to study why the bolts had come loose. Today's spacewalk was the second of four planned for Endeavour's mission, its final spaceflight and the next-to-last for the space shuttle program. It was the 246th spacewalk made by U.S. astronauts and the 157th in support of station assembly and maintenance. The spacewalk was a fifth for Feustel and the seventh for Fincke. Both are scheduled to perform the next spacewalk on Tuesday (May 24). In addition to working outside the station, the astronauts also delivered and installed the Alpha Magnetic Spectrometer (AMS), a $2 billion science experiment designed to study strange matter in the universe. You can follow Robert Pearlman @robertpearlman. Visit SPACE.com for complete coverage of Endeavour's final mission STS-134 or follow us @Spacedotcom and on Facebook.